We accept cash, personal checks, Visa and MasterCard. Sales tax and other fees may apply. 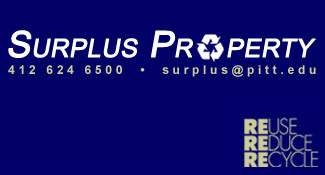 All Surplus Property sales are final. No Refunds or returns. Unless agreed to, all items must be removed at time of purchase. Drop your used inkjet and laser toner cartridges into recycling bins located in the Towers Lobby, the Cathedral of Learning, Alumni Hall, Benedum Hall, Chevron Hall, Posvar Hall, Salk Hall, and Scaife Hall. If you are in a building without a recycling bin, you can place the cartridge into a box and send it through campus mail to Surplus Property at 7500 Thomas Blvd, or email surplus@pitt.edu for free pickup of the cartridge(s).